"Hamish has significantly influenced the law on the way it now effectively deals with stalking." Rt. Hon John Denham - Minister of State Home Office. "I would like to personally thank-you for the contribution that you have made to life in London. At a time like this it is important that we take time to recognise people that work so hard to make London the great place that it is." - Ken Livingston, Mayor of London. Hamish Brown MBE is the recognised leading authority on the interpretation and application of stalking legislation in the United Kingdom. In 2004 Hamish retired from New Scotland Yard's Specialist Crime Directorate after over 30 years service with the Metropolitan Police. He was awarded the MBE in the Queen's Birthday Honours List for his services to victims of harassment. Hamish has been praised for his efforts with many tributes. He is the author of 'Stalking and other forms of harassment, an investigator's guide. ' 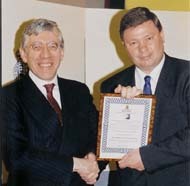 He was commended by the then Home Secretary, Rt. Hon. Jack Straw, for his research into this booklet. This is the most requested Home Office publication with a print run of over 10,000 copies. Hamish is also the author of the Metropolitan Poice advice leaflet ' Protection from Stalking and Harassment: A Guide to minimising the risk to children'. 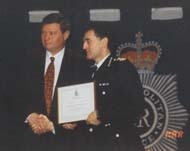 Hamish was presented with a commendation, by the then Assistant Commissioner Denis O'Connor, for a ground breaking successful prosecution of a stalker, who was convicted of GBH of the mind. Hamish also offers advice which you may find helpful. Additionally you can find more advice in his publications.